The Rae Lakes area is my second favorite camping area on the John Muir Trail. Beautiful! Last week I took you through the first half of what I consider to be a great itinerary for a thru-hiker who wants to successfully finish the hike with a minimum of pain and suffering, spend nights in scenic and interesting places, average around twelve miles a day (except for the last day), and work in some rest days and half days. Let’s continue. Day 13: Muir Trail Ranch to Colby Meadow, ~12 miles. Make sure you fix yourself two sandwiches at breakfast on the morning you leave MTR! They are going to taste awfully good in a few hours. Today is an uphill stretch, but, like the walk out of Red’s Meadow, it just doesn’t seem that tough. Perhaps it’s the incredible scenery. Many thru-hikers like to spend their first night out of MTR at McClure Meadow, and it is quite beautiful (and a few miles shorter for the day). But, on the second half of this adventure we are going to need to start to think a day or two ahead. By pressing on to Colby Meadow, we will be over Muir Pass earlier the next day. Day 14: Colby Meadow to [Someplace between Helen Lake and LeConte Canyon], ~14 miles. I love the John Muir Trail. There are few things in life I’d rather do than walk it. That said, from the Muir Hut to LeConte Canyon is the stretch I find least interesting. Walk as far as you comfortably can, find a nice spot, and spend the night. In fact, this would be a good night to try waterless camping, a few hundred yards off the trail, in a completely deserted area. Up to this point you will have probably have not camped alone. Why not give it a try? Day 15: [Someplace between Helen Lake and LeConte Canyon] to Lower Palisade Lake, ~14 miles. Mere mortals might tremble at the thought of ending the day with a climb of the Golden Staircase, but after two weeks on the trail you will NOT be mistaken for a mere mortal. Lean forward and push those legs of steel up to the first Palisade Lake. You have four passes in the next four days. To successfully negotiate them you want to be ready to attack the first, Mather Pass, early. By camping at Lower Palisade Lake you are setting yourself up for victory. Day 16: Lower Palisade Lake to Lake Majorie, ~12 miles. You popped over Mather before second breakfast, feeling like a champ. Today is another day that will end with a climb, but it is nothing like the Golden Staircase, and Lake Majorie is a gem. Plus, you are continuing to hike strategically. That is going to pay off in a couple of days. Day 17: Lake Majorie to Rae Lakes, ~15 miles. Pinchot Pass is only a little more than 1,000 feet above Lake Majorie. Get an early start and you will be over it before you put your sunglasses on. That’s a good thing, because today is the day you really want to make some progress. 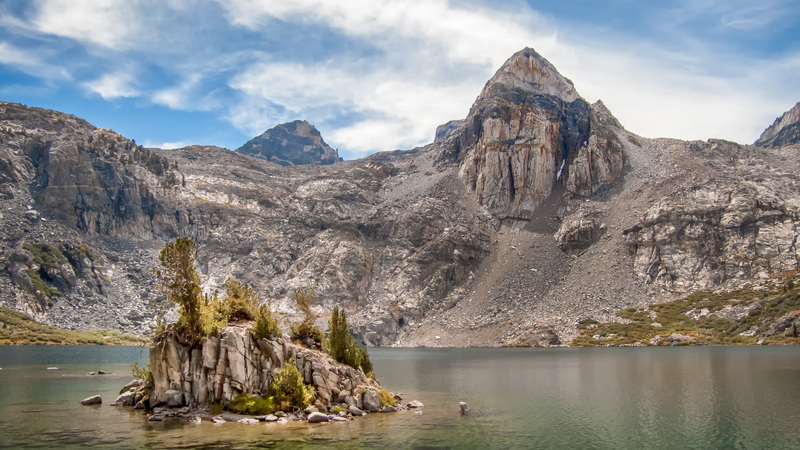 The Rae Lakes area is my choice for the second most beautiful spot to camp on the entire JMT (right behind Marie Lake), and it makes for a perfect launching point to attack tomorrow’s pass. Day 18: Rae Lakes to along Bubbs Creek, ~10 miles. Glen Pass is a tough one, but by camping at Rae Lakes you are up and over it before it can mess with your mind. Congratulations. You can now spend the rest of your life commenting on how easy Glen Pass was – that you really don’t understand why people think it is so tough. Your welcome. Before you get too cocky, though, remember the highest pass on the trail is still ahead, tomorrow: Forester Pass. This is a good place to spend tonight. Day 19: Along Bubbs Creek to Wallace Creek, ~14 miles. The last of the final four passes is behind you. Forester Pass is high, and the hike up is long, but the trail is so well made (and you are such a hiking machine by now) that it’s no big deal. The hike down to Wallace Creek will probably be the fastest you have ever walked. The trail is soft and forgiving, the grade consistently downhill but not that steep, and Mount Whitney is getting closer by the minute. Why not move out smartly! Day 20: Wallace Creek to Guitar Lake, ~8 miles. Your penultimate day is a short one, but that is okay. Tomorrow is the longest of the trip. Pull into Guitar Lake early so that you can claim a decent campsite. Spend some time during the afternoon off your feet and get to bed early. Make sure you have a good dinner and hydrate! Day 21: Guitar Lake to Whitney Portal, ~17 miles. It’s almost impossible to get on the trail too early on the last day. The last time I camped at Guitar Lake I was up at 1 a.m. and on the trail by 1:45. That allowed me an hour at the top of Mount Whitney and got me at the portal before 4 p.m. Two hours later I was clean, in street clothes, and sitting at Seasons in Lone Pine eating a steak. Some folks suggest splitting this distance over two days, but I find once I get within six miles of the portal, I’m not stopping. If your itinerary looks a lot different than this, then your goals are probably different as well. But, if you are looking to spend about three weeks on this trip, this is a great start to your plan. I can taste that steak and Sierra Nevada Pale Ale from here. How a restaurant as good as Seasons ever made it to Lone Pine, where you would imagine Denny’s would be as good as it gets, is a mystery. Their twist on a caprese salad is amazing, too. Thanks for the comment, John. I always look forward to reading your new posts. This one couldn’t be more timely. My husband and I will be coming over Piute Pass July 4 and picking up the JMT southbound at MTR bound for Whitney. We’re planning a zero day at Rae Lakes and a resupply at the Mt. Williamson Motel (zero day). Do you think we’re being overly ambitious starting at Centre Basin, over Forester Pass, down to Tyndall Creek and camping at Wallace Creek? Thanks for your input Ray and for sharing your ‘love affair’ with the JMT with all of us. All the best. While I am always reluctant to comment on pace, because it varies so much between hikers — even fit ones, this certainly seems doable to me. Forester Pass is high, but the trail engineering is terrific. Once you come down the pass the route is compacted dirt and an easy descent; you should be able to really move out. A zero day at Rae Lakes sounds amazing. Although I’ve never done it, I’m told that the Painted Lady is a pretty easy peak to bag! Thanks for the comment, Sylvia. Thanks for this, Ray! Helped me finalize my itinerary this year. You are very welcome, Mike. Glad it helped and good luck with the hike! Ok, I am planning out for next year and love the idea of following an educated itinerary. But I just got through requesting reservations at Tuolome, Red’s Meadow, and MTR, but um, how do I get food after that? Thanks for the question, Damien. You have three choices: hire a packer to bring it in, walk out at some point and collect it from somewhere, or carry everything you will eat in the last half when you leave MTR. Good luck with your planning.